Authored by alexde on Oct 7 2018, 3:51 PM. This contribution was motivated by a comment on Nate's blog. Changed the icon from "visibility" to "hint" as it describes the action better. Also added another missing icon to "Show all entries". Could you add some screenshots? Also, it may not be best to choose a Breeze icon based on look, rather than name. Other icon themes may use something entirely different for hint. For the moment this is probably the best we can do. 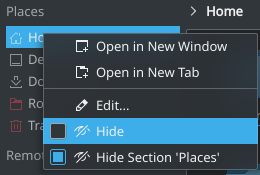 Dolphin uses the same visibility/hint switcheroo for the Hidden Files action which I agree is not ideal. I've been mildly irritated by this myself when browsing the code, but never enough to do anything about it. I just tried submitting a patch to change it (D16028) but ran into arc problems and gave up. For now, please stay with visibility and hint, this is fine. Typically it's not ideal to use the same icon for two different adjacent things, but I think it's fine for now, and better than no icon. Dolphin currently does not use the KIO code for parts of its places panel, so this change needs to be replicated for the KIO code so that Places panels in the open/save dialogs and Gwenview (etc.) get the change too. Can you submit a patch for KIO too? The code is in <kio repo>/src/panels/places/placespanel.cpp Thanks! Once you submit that patch and both are accepted, we can land them both. Fair enough, just something that I noticed after dealing with some of that with Gwenview. There is too much duplication in dolphin, which should't be there ideally. Why dolphin cant use the same copy from KIO , instead of its seperate copy? Are you sure about the path and file? I could not find it in the kio repository. However, I found another cpp file which looked promising: <kio repo>/src/filewidgets/kfileplacesview.cpp. Which version is correct / preferred in which cases? Argh, you are correct! I gave you the wrong path, sorry.